Photo above – Steve Brian, left, receives the President’s Award from Kevin Britton. 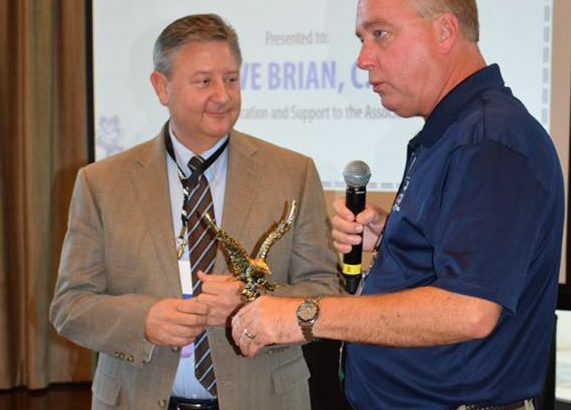 Steve Brian, Manager of the State Aviation Program for the Georgia Department of Transportation, was presented the President’s Award Last week during the Georgia Airports Association (GAA) Annual Conference and Exposition held at the Jekyll Island Convention Center. The President’s Award is presented annually at the conference and is awarded solely at the discretion of the President. “I chose Steve because more than anyone this past year, he helped me shape my presidency,” said Kevin Britton, Vidalia Regional Airport Manager and President of the Georgia Airports Association.